The Winter Hexagon, also known as the Winter Circle, is an asterism in the northern hemisphere's winter sky formed by bright stars in six different constellations: Rigel (Orion), Aldebaran (Taurus), Capella (Auriga), Pollux and Castor (Gemini), Procyon (Canis Minor), and Sirius (Canis Major). Pollux and Castor effectively form one vertex of the hexagon as they are just a few degrees apart. In the southern hemisphere and tropics, the Winter Hexagon becomes the Summer Hexagon and can be extended with the bright star Canopus in the south. 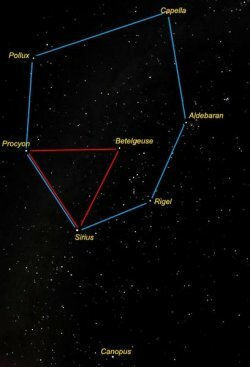 Two vertices of the Winter Hexagon, marked by Sirius and Procyon, are shared with the smaller and more regularly shaped Winter Triangle.